The European Environmental Paper Network has always made saving paper it’s top priority. We want to make it easy to use less paper, so here are our Top Ten Tips for Paper Saving in Business, and our Teaching Handbook on the topic. Less paper consumption is the first pillar of our vision for a more sustainable paper industry in Europe, and in fact we set a goal that we want to see paper consumption reduce to half 2005 levels. This is because environmental footprint analysis shows that if everyone on earth consumed as much paper as we do in Europe, we would need two planets to supply them. But of course, we only have one! The United Nations has suggested that everyone on earth deserves access to around 30kg of paper products per year. Paper is vital for education, full participation in democracy, medical hygiene. There are many really valuable uses of paper that improve our lives and enhance civilisation. Currently billions of people on earth are below this ‘paper poverty line’. The only way we can ensure that everyone has access to the paper they are entitled to, without exceeding earth’s ability to provide it, is for countries who use paper wastefully to reduce consumption. Here’s a video, which explains why this is so vital. 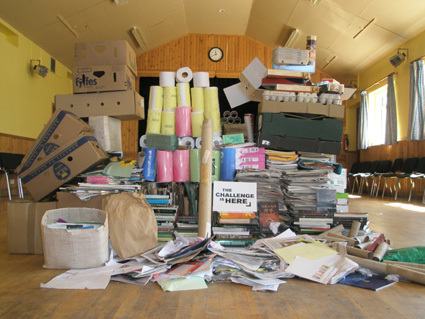 Between 2010 and 2011, the European Environmental Paper Network ran a project looking at education about paper use and this project produced a teaching handbook about paper saving. You can read it here. We also ran a project working with companies to cut their paper use, thanks to funding from the Esme Fairbairn Foundation, which resulted in our Top Ten Tips for Paper Reduction in Business. We’re planning to continue this work with a new project helping a wide range of businesses and big organisations to find efficiency gains in their paper use – thus saving money and bringing ethical benefits as well as reducing their forest footprints. If you would like to know more, or if you would like to get involved, please contact us.